If you are following me on Twitter, you already know that my new book is out. It is called "Social Commerce ...it is a completely new playing field" - or "Social Commerce... What does it all mean?" It is 153 pages and comes with 46 color illustration. You can get if for free if you are a Baekdal Plus subscriber, or buy it stand-alone as a Kindle book on Amazon. Social commerce is one of the many buzzwords that keep floating around. Most people think it is about setting up a shop in a Facebook tab, or maybe do a promotion on Groupon. But while that technically is part of the concept of social commerce, it is only a very small fraction of it. The real concept of social commerce is not about things or places. It is about people, what they do, and how you can convert that activity into a sale. The essence of social commerce is sharing. People do not share a shop. They share very specific products, for very specific reasons. Also, people do not share a Facebook tab, so creating one (with or without a shop in it) isn't going to do you much good. The real activity happens in people's streams. The places where people see what other share with them. That is what you need to focus on, and that is where you need to start converting the social activity into sale. This is what this book is about. The shift from store to product. The shift from browsing to sharing. What you need to do about it. How you need to design your store (or rather your product pages), and how to release it to the world. You can get it for free as a Baekdal Plus subscriber, or buy it at Amazon. Note: As a subscriber you can download the book as a PDF or in epub format. Both completely open with no limits or restrictions, so that you can read it on any device (or print the PDF if you so prefer). There a social back story to this book as well. The reason I wrote the book was because some of my friends on Twitter asked me to. At first I only planned it to be a single article, but once I had written it I realized that the first article only told a small part of the story. The special thing about social commerce is that the effect is a mix of several different trends. It is not just one thing that is disrupting the world. It is the trend of people having the power to communicate on a scale never before imagined. The trend about technology enabling us to connect directly, personally and specifically. The first article was about what people specifically shared, and how you needed to react to that. But that left all the other trends. So I started writing the second article, then a third, then a fourth... until I realized that it wasn't the right way to tell the story. The articles needed a sense of continuity. It wasn't possible to tell this story as individual articles, because you would never get the full picture. I took my iPad to a quiet spot, and started sketching out all the trends, concepts, ideas, actions and reactions of social commerce - and tried combining them into a coherent whole. The result was 51 sub-stories - which I then distilled to 22 *important* topics. 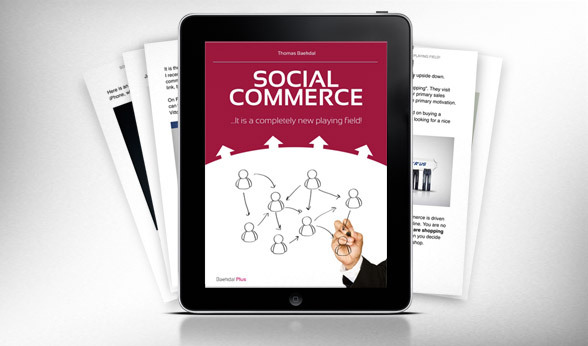 The result is the Social Commerce book. 22 topics that explain the why, what, where, and how of social commerce. Hope you like. Love to hear any comments you might have!